I am always trying to find new ways to sneak veggies into my husband’s taste bud preferences. Broccoli is delicious and full of nutritional goodness so I thought I’d play in the kitchen and here’s what I came up with. 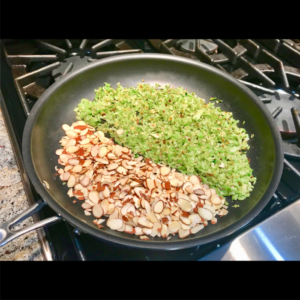 Toasted almonds and broccoli rice. Start by heating the avocado oil on medium low heat for a minute or two. 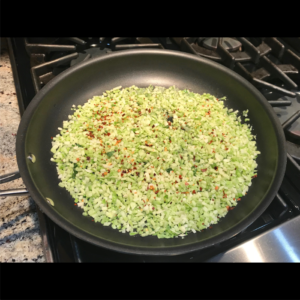 Once the oil is heated add 1 and 1/2 cups broccoli rice and spread evenly into the pan. Cook for about 8-10 minutes. Reduce to medium low heat to avoid burning. Season with a light sprinkle of chili flakes. If you are adverse to hot spice then add a pinch of paprika or some black pepper instead. Let it cook until it turns a light lime green color. After it turns lime green let it cook for another few minutes but keep an eye on it so it doesn’t burn. Stir around the broccoli rice for a minute or so. If you haven’t already, go ahead and reduce to low heat at this point. 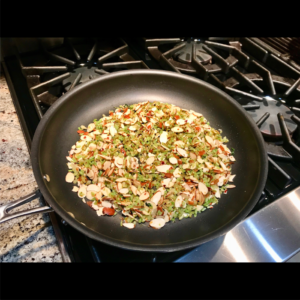 Push the broccoli rice to one side of the pan and add the sliced almonds to the same pan. Let it cook this way for 5-7 more minutes or until the almonds are slightly toasted. Mix it all up for another minute or two then turn the stove off. 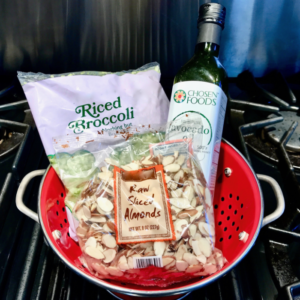 Your toasted almond broccoli rice is ready! I like to serve this alongside other veggies or a piece of fish. Served cold it tastes delicious on top of a green salad. Vegan, vegetarian, gluten free, diary free, keto, paleo, side dish, salad topper.